New video from American Magic that shows a transition to foiling starting at about 0:20. I'd like a bit more sailing content and a little less filler. I saw that together with the ammount of professionals that are involved in American Magic. They emphasise on the international teamwork. Here is a video from team the Netherlands that are in negotiation with ETNZ. Probably about the foil canting system. This was found by Earl Boebert and posted under the "Stability"forum. I'm trying to post a google trans version. The forum said it had to be posted with less than 20 images so I think I was able to do that with very little, if any, damage to the paper. View the original in the "Stability" forum to decide for yourself. Somewhere there may be a pdf of this paper-I'hope we can find it. This is an outstanding article and I thank Earl, again, for his effort in finding it! In navigation, a Foiler is in equilibrium under 4 systems of forces. Each force is a 3D vector, which evolves during navigation in intensity and direction. Only the vector representing the mass of the boat and its crew is always vertical and constant in intensity. Ox: Lateral direction (lateral drift). Vélique Force : It is produced by the lift of the sails, it evolves according to the wind, the orientation of the sail, the type of sail and the list. Component on Ox: the drift, the boat usually slides under the wind. Force produced by the Foil : It is produced by the lift of the foil. Orientation Adjustment (Vertical Axis), (Named "YAW"). This force is upward, its vertical component (parallel and opposite to the WEIGHT vector of the boat) is usually called the LIFT. In fact this component raises the FOILER and allows him to leave the Archimedean mode to evolve in the Foiler mode. The intensity of this force is the preponderant factor of a Foiler. That the foil picks up and the whole building collapses . This horizontal plane is a symmetrical profile because its lift must be alternating, that is to say directed upwards or downwards. It is this lift that regulates the horizontal attitude of the Foiler. We must not forget that a foiler like the AC75 is " centering AR ", that is to say that its center of gravity is located behind the thrust of the front foils. Under these conditions the rear tail, following its angle of incidence produces a torque (+) or a torque (-), either "pitched" or "pique". The boat's mass generates a vertical force applied to its CG center of gravity. The CG is practically invariant in navigation in a defined configuration .
" DOCKING ", the boat comes out of her "stand" and is towed to the exit of the port. Both foils are folded under the hull. The boat capsized at 82 ° heel. 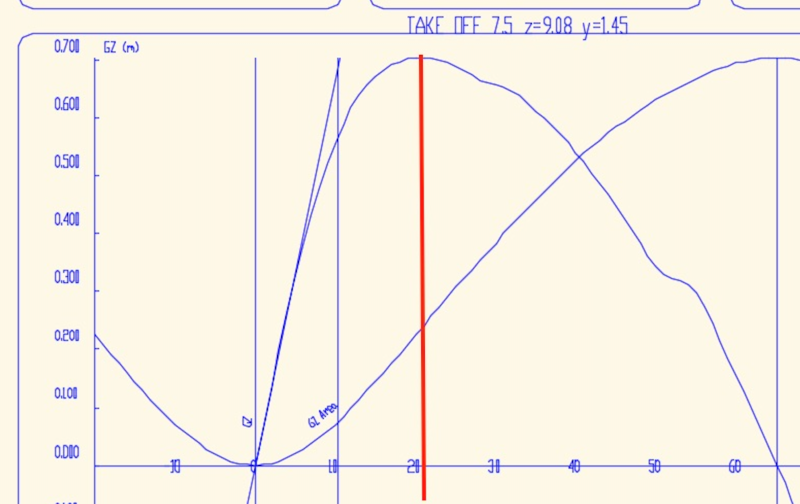 Without caricature, say that in this configuration, the AC75 is "biquille". In order to prepare for the take-off, the crew leaves the DOCKING mode and mechanically installs the foils in Archimedean mode in order to "roll on the track" and thus switch to "FOILER" mode. The transverse stability must be seriously controlled in navigation. The boat capsized at 62 ° heel. The " TAKE OFF " is the most sensitive phase. Indeed the hollows trough being relatively small (about 0.370 m), as soon as the boat will gain speed and create "LIFT" on these two foils, the hull will quickly completely out of the water and leave the area Archimedean. Calculations based on buoyancy, the center of hull, no longer make sense. The foiler becomes an airplane with its two wings and tail tail. Its stability of flight then depends on the dexterity of the pilot and the crew who regulates the foils and the "engine", the sails. This will result in the pitching of the platform to increase the angle of incidence of the foils, then by a return to a horizontal attitude where the angle of incidence decreases, since the speed has stabilized. The two photos above, which show the progress of the foiler are taken with a single active foil, but the "TAKE OFF" on two foils proceeds from the same evolution of the flight. To look, everything seems simple ...... and easy. It may be possible to take off on a single foil, the foil in the wind being in high position, so out of water Archimedean regime. But the operation will require a serious know-how because of the dissymmetry effect of the carrier plans. 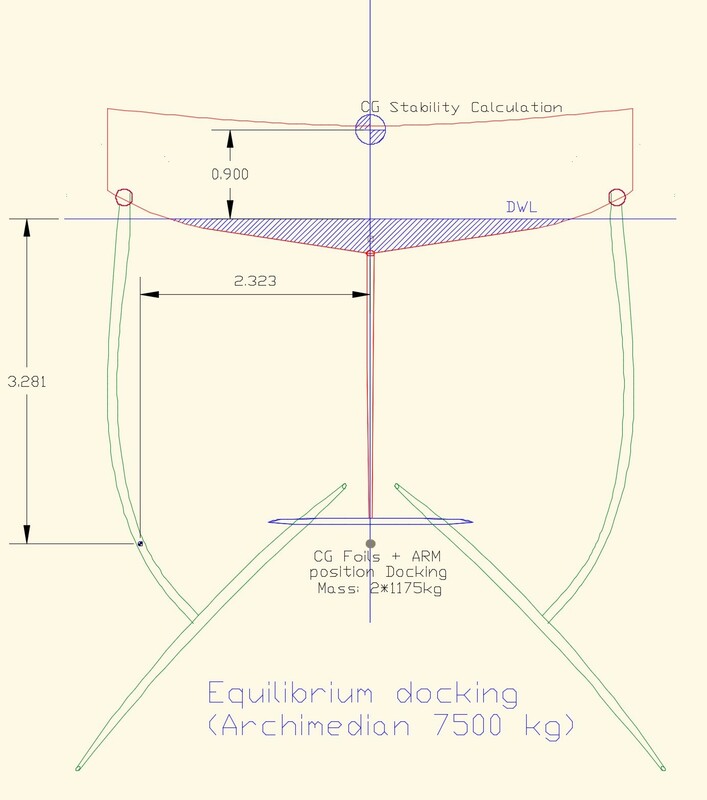 Indeed this asymmetry generates an imbalance of the "LIFT" under the wind, about 6m from the center of the hull when the boat is still in Archimedean. Then, with two carrying planes, the 7500 kg of the boat are distributed on each of the 2 foils, which allows to take off at a lower speed, so on a length of "track" less important. The boat capsized at 48.6 °. It is obvious that at "ignition" engines, the stability is equivalent to that of a catamaran like TORNADO . But as soon as the submerged foil will produce lift and the Righting Moment will increase. This will ensure an acceptable compromise. However, only the tests will really check the calculations and the models. On the other hand, the take-off conditions are different between the configuration of 2 active foils or 1 active foil . The foils are not horizontal in navigation, but have a "V" geometry. The angle is about 18 °, which requires a real lift of the foil greater than the weight of the boat. 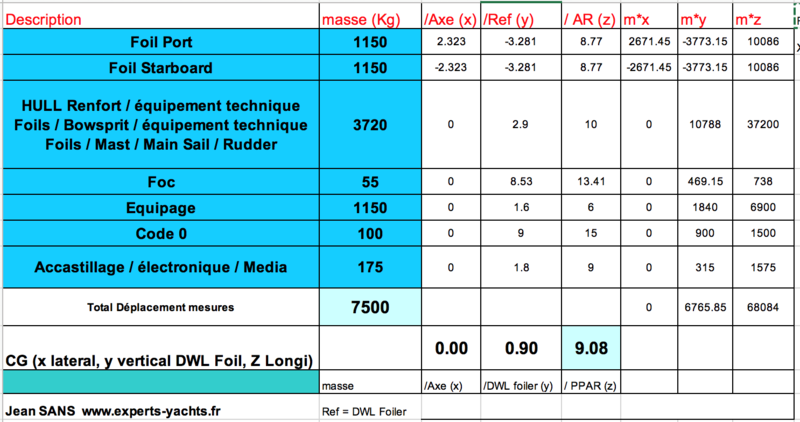 In the geometric configuration of this foiler, to lift the displacement of 7500 kg, a total lift of 78000 N. is required. 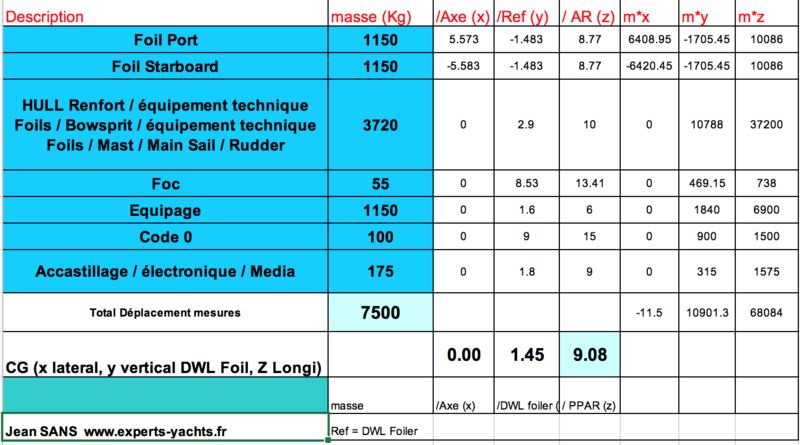 Takeoff phase, when the boat is based on a single foil : 78000 N on the foil. 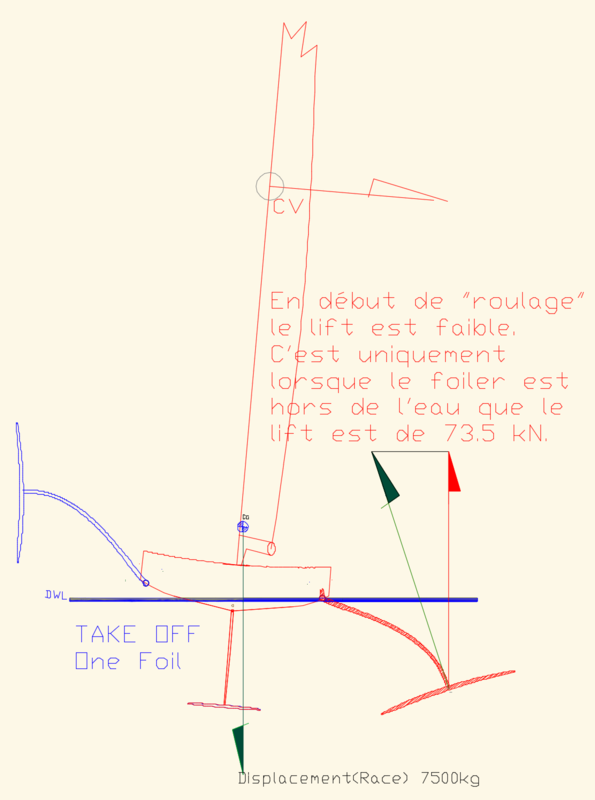 It can be added that in the configuration TAKE OFF on a single foil, the drag of the active foil being proportional to the lift (and therefore the speed), the torque resulting from this drag will increase, which makes the steering very sensitive during this Archimedean passage phase in the Foiler phase. 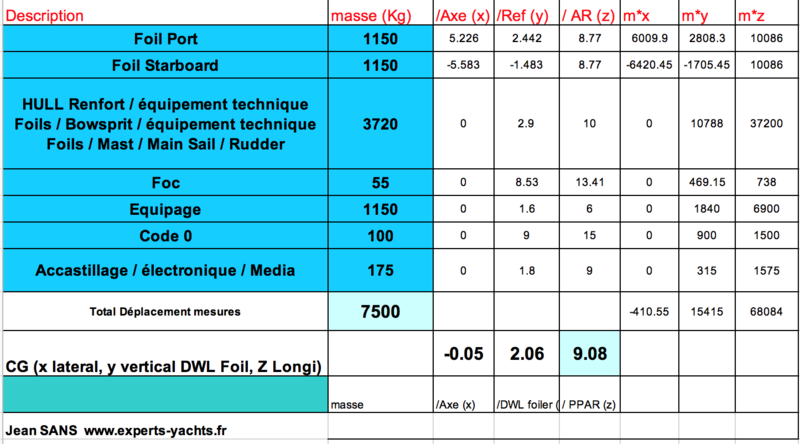 Opposite, the weight estimate of the AC75 with a single submerged foil. This illustrates the physical conditions of the Foiler (CG: 2.06m / DWL) during takeoff on a single foil. 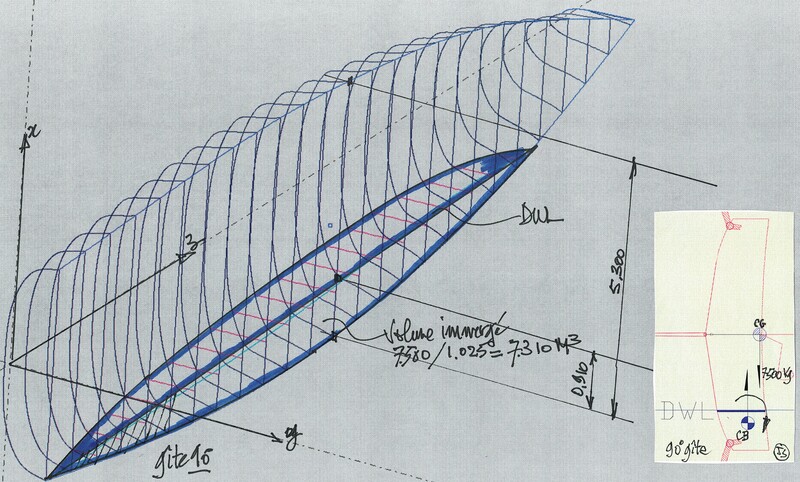 A foiler on 2 supports and a rear plane regulator has a seat of stability much more important and especially less unstable than what will happen on the AC75 which must fly on a point of support in the wind and whose longitudinal attitude is controlled by the saffron bearing plan. In "VOL" mode, there is no question of center of hull, buoyancy, Archimedean laws. Everything happens around the centering of the Foiler , centering which is necessarily a centering back. In these conditions of flight, the capsizing is possible on the other hand there is little chance that the capsize is only lateral. 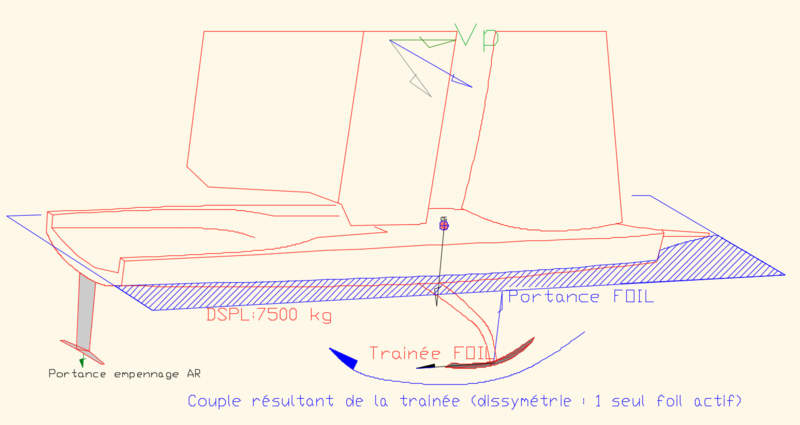 Indeed, the capsize will result from a fall of the lift on a foil, fall all the more brutal as it will be very complicated, if not impossible, to associate the stall of the foil, even spotted with sensors, with the reaction time to act on the rear rudder (bearing plane of the saffron) so to regain lift. The lever arm (15 meters) of the veil lift is very large. 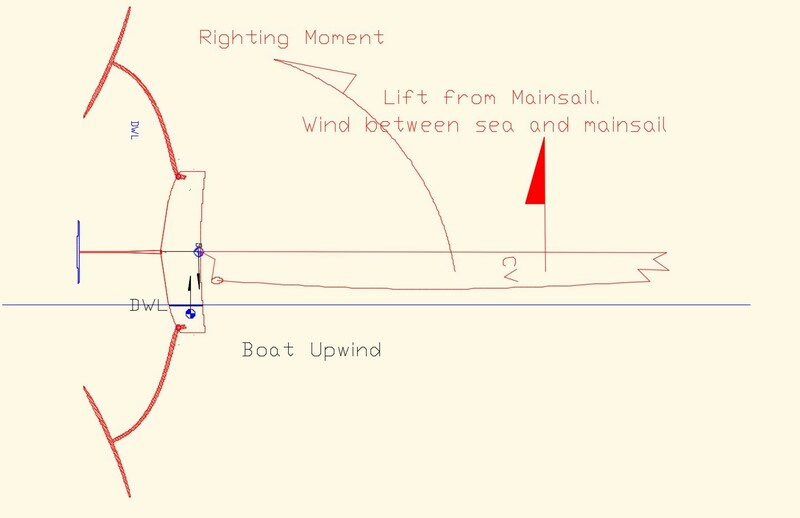 I add that it is not the transverse component that causes the capsize but the propulsive component directed forward but the cause of the capsize remains the stall of foil leeward. It is certain that unlike the AC45 and AC72, the new AC75 will not remain capsized (at 90 °) submerged bow to the base of the mast (approximately). 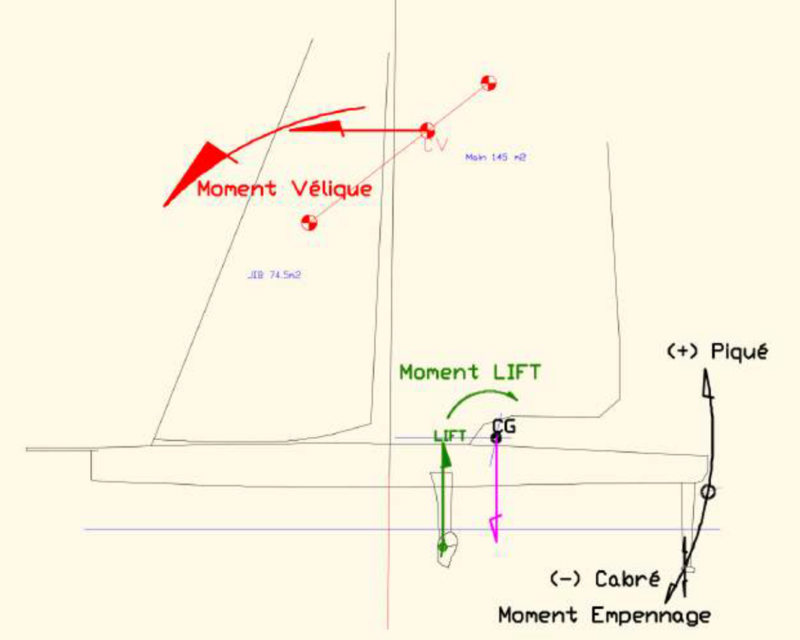 The reason is simple, the AC75 is a monohull that will be totally unstable in this position. In the hypothesis that it sancirait, this configuration will be very temporary and very quickly the AC75 will be capsized like a 505 or a simple Dinghy. It should be noted that it is expected that the profiled tube of the mat is waterproof. This in theory prevents a Capsize. Capsizing with both foils in the low position. This is the configuration that appears as the most easily recoverable, to return "Upright". 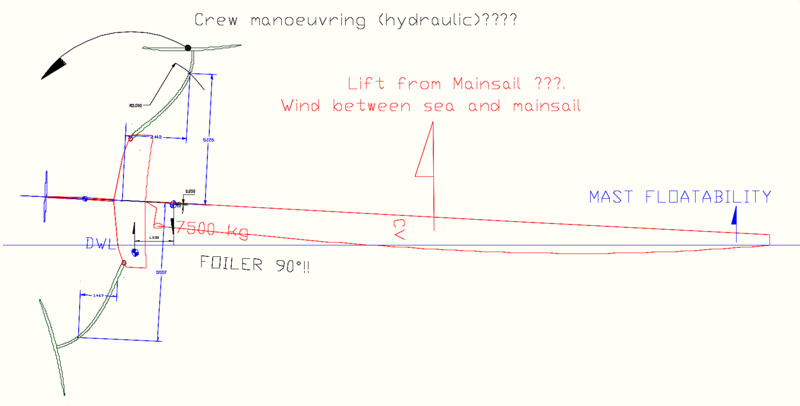 Indeed in this configuration (boat at 90 °), the center of gravity of AC75 is located substantially in front of the center of hull, about 300 mm. Of course the moment of recovery is not favorable since the CG of the boat has passed the vertical of the center of hull, but with the buoyancy of the mast (high part), the AC75 will stabilize towards 95 °. The 90 ° hull is squeezed about 900 mm. One method, already used by Loïc PEYRON on the AC45, to straighten the boat was to place the catamaran in the wind with the help of a semi-rigid. In this position, the wind rushes between the rigid wing and the surface of the water. With this effect of "ground" combined with the lift of the wing directed upwards, a moment of recovery appears and allows to put the boats "Upright" (in theory). But do not be deceived, it is a safeguarding maneuver which implies that the boat abandons the regatta. Capsizing with the foil upwind. This is the configuration that appears as the most difficult to recover, to bring the boat back to "Upright" position. 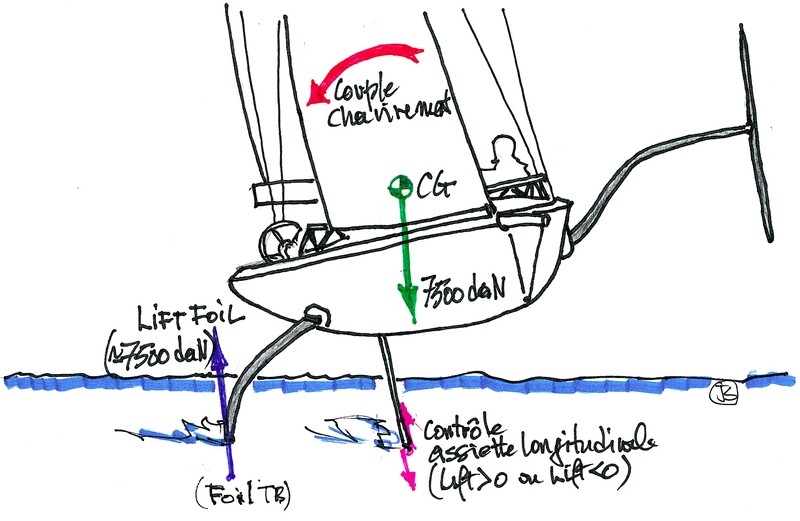 It is also, when the boat is lying at 90 °, the configuration of the foils which seems the most dangerous for the crew. Indeed, the foil which is in high position is entirely above the work area of the crew (cockpits). 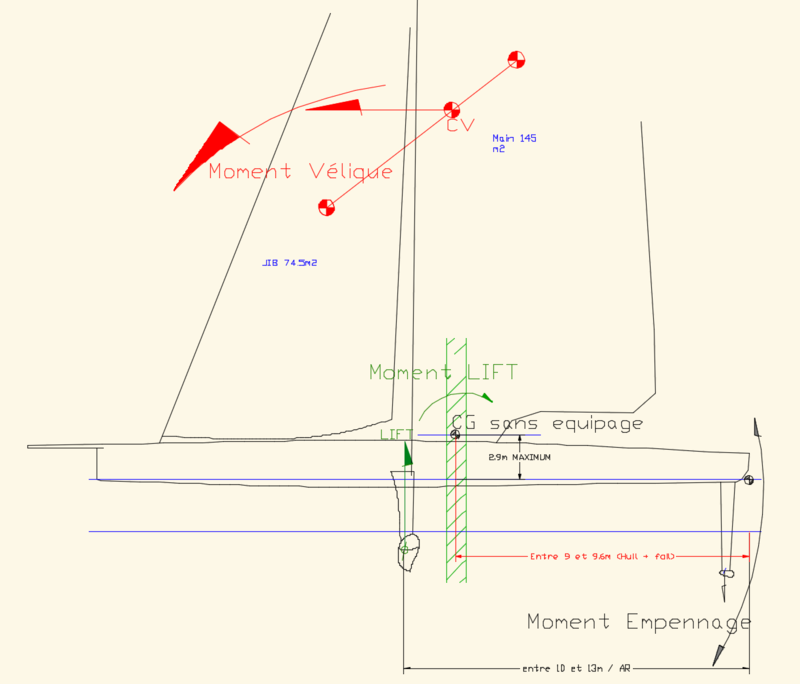 Efforts on the structure of the boat are less important than when the AC75 sails on a foil, but this configuration results from the uncontrolled rotation of the boat during capsizing. The shock of the mat on the water amplifies the solicitations. Note the vertical center of gravity of the boat is 1.5m from that of the center of hull. This implies that it will be necessary to defeat this couple to return to the Upright position. Admittedly, the crew (but in what ergonomic conditions) can use hydraulics to bring the upper foil back into the symmetrical position of the submerged foil. This implies that the hydraulic power plant (10000 psi / 800 bar) works when the boat capsizes at 90 °. While in the event of capsize, the regatta is over, but it is not necessary that this incident, which seems possible endanger the crews. All these calculations were made using the minimum values of the positions of the centers of gravity imposed by the class rules of the AC75. I think that the architects of the various Teams will be beyond (in the good sense) of these limits to ensure a better stability in navigation. 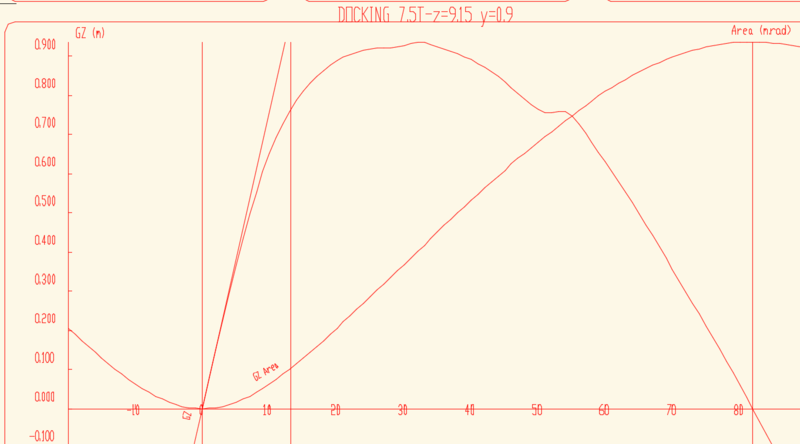 I built a volumic model, my goal being to study the stability and not the speed potential of a hull. The capsizing on a single foil can also end with foiling under the water. It is less dangerous if the attachment of the upper arm is broken. 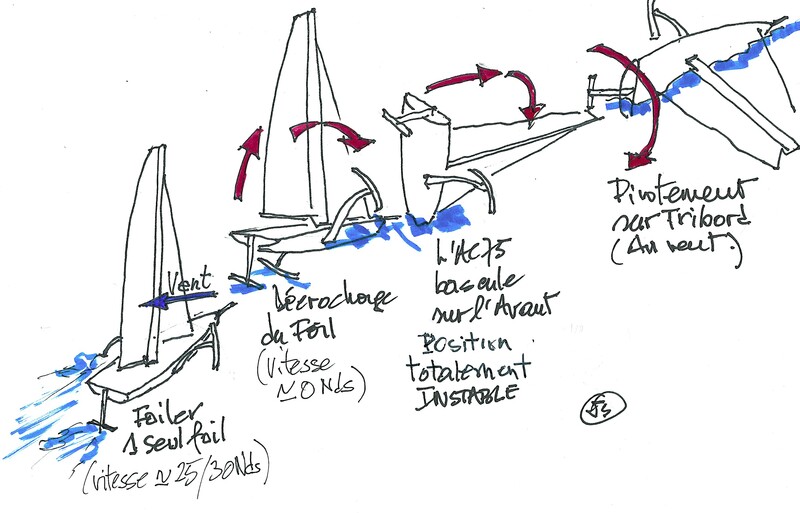 Foils seen by Jean SANS - Part 3: What if monohulls dreamed to fly? The Mule, the test boat for the American Magic challenge, is now able to fly round a 16-mile course, the big challenge for the future AC75 according to US Challenge foil trimmer Andrew Campbell “If you’re not on foils for 98, 99 percent of a race, you will not be competitive”. Sirena warned that the new boat lacked the stability of the catamarans.